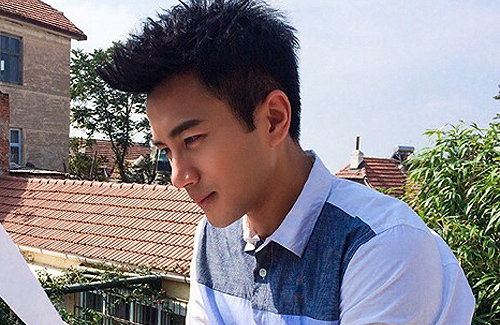 Hawick Lau (劉愷威) had a remarkable turnaround in his acting career since shifting his focus to the Mainland Chinese market. The busy 40-year-old still finds time to share his generous heart with underprivileged children, as he loves their innocence. Getting married and becoming a father, this year has been a time for changes and personal growth for Hawick. After the birth of his daughter, affectionately nicknamed “Little Sticky Rice”, Hawick found greater inner peace and learned to slow down in life. “Many people always try to keep themselves busy and occupied, as if they think any hour not spent productively is a waste of time. When I hold [my daughter], I can look at her and not do anything for several hours, and still feel content.” He loves watching his daughter sleep, as it keeps him calm and motivated. During the filming of Angel’s Smile <天使的微笑>, a Mainland drama series that features the lives of nurses, many of the orphaned and physically disabled children who were involved in the filming had a large trailer to rest in on filming breaks. It was initially thought that the school had provided the trailer, but later it was discovered that the trailer had been quietly sponsored by Hawick and his wife, Yang Mi (楊冪). Hawick admitted that the subject of celebrities doing charity work has always been controversial, as their sincerity is often doubted by the public. Nevertheless, he is not bothered by such speculation and believes in using his celebrity status for raising awareness for certain causes. In 2004, Hawick was cloistered within the boundaries of TVB in Hong Kong. He had no idea about opportunities that existed in the Mainland market. Often confined to playing uninspiring supporting roles at TVB, Hawick did not make any progress in the first decade of his career. “I can only blame myself for the lack of progress then, as I did not make good use of my opportunities. I also did not know how to look after myself,” Hawick said candidly. Dissatisfied with his stagnant career, Hawick opted to leave TVB after a moment of awakening. He realized that people around him were capable of looking after their families, but he was not shouldering the same responsibility at home. Hawick added, “My family did not say anything to me, but the less they said, the more guilty I felt. I was angry with myself for a while, wondering why I had not realized this earlier.” Hawick was also motivated by the wish to be able to work with his father Lau Dan (劉丹) as an equal. Brushing up on his Mandarin skills and forging valuable connections in the Mainland industry slowly, Hawick built his career successfully. Last year, Hawick established his own studio to produce his television dramas. With his fortunes taking a dramatic upswing, Hawick was ranked in the 19th spot on Forbes’ 2014 list of top celebrities in China. A warm & inspiring article worth reading! Though the photo spreads from source article crack me up! I gotta say I don’t know if above is a recent shot but he sure looks HOT for a 40 year old? hahah LOL..Wow..YANG MI IS ONE LUCKY GAL AND VISE VERSA. It shows TVB is not the only vehicle for a successful acting career.